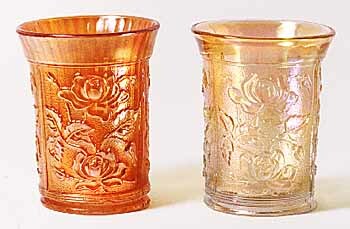 Imperial made two versions of its Lustre Rose tumblers. The regular tumbler, in marigold, is on the left. It has vertical flutes inside. The variant, on the right in clambroth, does not have the flutes. Variant pitchers also lack the fluting.